Joe Frazier Autographed Photo 8x10 #162 | Sports Memorabilia! Joe Frazier Autographed Photo 8x10. The great Joe Frazier passed away November 7, 2011. This photo of Joe has always been one of our favorite and best sellers here at National Sports Distributors. 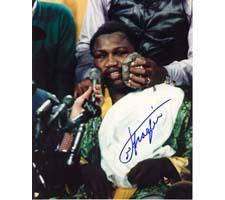 As always, NSD was with Joe Frazier when he autographed these photos for our company. A NSD numbered hologram and NSD certificate of authenticity is included.